While history regards the Meritech Wars as being fought for the rightful retention of Imperial territory, the truth is very different. The seperatists of Promethia were given the tools to persecute their rebellion by a powerful Archeo-heretek cult, “the Logicians” who regarded the conflict as little more than a large scale field-test for their latest designs. The scale of destruction wrought by this conflict rivals that of the horrific Margin Crusade, with the Meritech holding the furious armies of the God-Emperor at bay for 17 years. Accordingly, the Logicians regard the experiment as a triumph, unequivocally vindicating their heretical pursuit of innovation and advancement. While devices such as the Inertia-Cannon and Helix-Torpedo were the primary focus of the field tests, a number of lesser ventures were endorsed by the cult during the closing decade of the conflict. Among these were the gene-manipulation experiments of a little-known Magos-Primary, Umbra Malygris. Ill-regarded by his peers for his lack of applicable outcomes, Malygris nonetheless produced a number of breakthroughs in sub-cellular DNA mapping, his first steps on the road to infamy and excommunication in the Calixis Sector. In order to safeguard his discoveries, Malygris built a nightmarish vault slightly out of step with real-time. Anchoring the vault to reality with xeno-crafted gravity locks, Malygris could disappear into his lair for years at a time, losing only weeks or months in real space. The "Altar of Genocide", where he housed his most innovative designs, would dip back out of the warp at times of great portent, always heralding some new misfortune for the Imperial war-effort. Eventually discovered by Lord-Admiral Calixis, it was the site of the last great battle of the Meritech Wars, and several conflicts in the decades since. Malygris himself is said to have died in the Inquisitorial purge of House Koba 300 years later, but his influence continues to plague the Sector. Notes recovered by heretical factions during the subsequent Battles for Altar are said to have engendered the Fenksworld Gene-Atrocity, the Gene-Wracking of Malfi's nobility, and the even the high rate of mutation which led to the War on Tranch. Before he disappeared into the Adranti Nebula, Malygris plumbed the depths of humanity's genetic potential. Unlike his financiers, he believed that flesh was the key to the advancement of mankind, particularly in it's ability to evolve (or more accurately mutate) to accommodate the needs of the species. His research into the growing 'mutant phenomenon' led inexorably to the Navigator Houses, and the concept of “programmed gene-stability”. His research produced an artificial “perfect cell” replica, derived from the combined gene-mass of captured Imperial Navigators, and he claimed to have unlocked humanity’s next logical step in evolution. Though he ultimately abandoned this line of inquiry for his pursuit of the ‘Silicus Anima’, Malygris succeeded in cloning a stem-cell bundle capable of replicating to a programmed framework. At the earliest stages of its’ growth, this specimen displayed Navis Gene traits vastly beyond those of developed Navigator Houses. But the experiment went unfinished as other research gained momentum and the Magos ultimately fled. Under the care of the vault’s Construct-Intelligences, the specimen was furnished with engineered tissue, alloyed bone-structure and sanative nano-bots. It grew to fulfil the Magos’ long forgotten design, and passed into stasis once development was complete. It was not until 807.M41 that the vault was opened and the true test begun. When Leo Arkaidos and his retinue breached the vault during the 3rd battle of Altar, the specimen was released. He was found unconscious at the foot of his Cryo-Tube in a pool of intravenous fluids, and recognised as Navigator by his pineal eye. 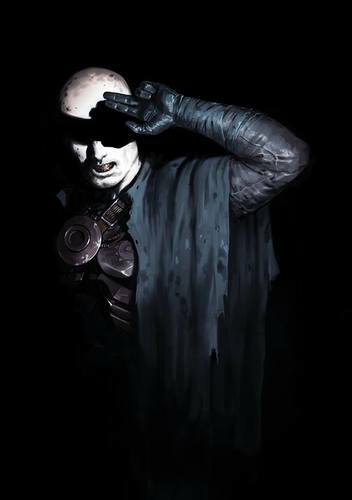 Collected as a curiosity by the boisterous young savant, he was light-heartedly dubbed “Hades, lord of the Undervault”. As fortune would have it, this simple act saved their lives. Left in a heap while the breaching teams worked, Hades gained consciousness as the Vault’s true guardians closed for an ambush. Sweeping past Hades were the corpses from which his cells were harvested, silent on bare and withered feet. Imprinted only with simple battle protocols, Hades first act in this world was the murder of his progenitors. Snapping instantly into awareness, he launched himself at the servitors, lashing out with tooth and nail and flaying lobotomised brain matter with his uncontrolled Powers. Alerted at last to the encroaching horde, the Cadre blasted a path through to freedom, surprised by Hades’ fluid adoption of their formation. During his thorough examination by Battlefleet experts, it was postulated that Hades had been clumsily mind-wiped by the enemy; he had no ability to communicate, nor even the most basic social skills. Judged free of taint, and indeed, in startlingly good health, Hades began his tutelage alongside the Schola-initiates of the Ark. In conformity with the expectation, his learning was rapid, though of course this was owed to unique brain-matter, not pre-existing expertise. The truth, known to few others than Leo, is that Hades was not frozen for 11 years, but is rather 11 years old. His accelerated learning capacity has furnished him with the basic skills to operate in human society, though his understanding for things like compassion and restraint are still ill developed. Particularly his straight faced slaughter of 30 Redemptionist fanatics on Footfall is of concern to Leo, though he qualifies that concern by admitting to shouting “Stop them, they’re into my psyker!” Whatever his destructive talents, Hades has come to be appreciated by the Captain’s Council for his impassive logic and relentless curiosity. Leo particularly relates to his childlike trait, and the pair have caused between them no end of exasperation for the more conservative crew-members. Having come to regard the crew as his family (who have in a very real sense raised him), Hades travels alongside them to fill the spaces in his empty mind. Every experience is a new and exhilarating affair, and it is perhaps this sense of wonder which engenders the trust of the Council; those who might otherwise see only dark potential.